Our homes are very special to us. But they are extra special when we create our home atmosphere ourselves. 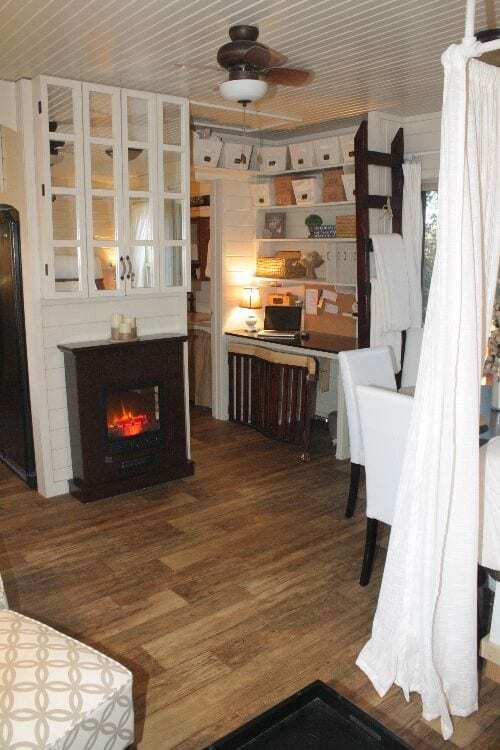 This sweet tiny home in Fayetteville, Arkansas was designed and decorated by Lauren Sivewright and her mother. 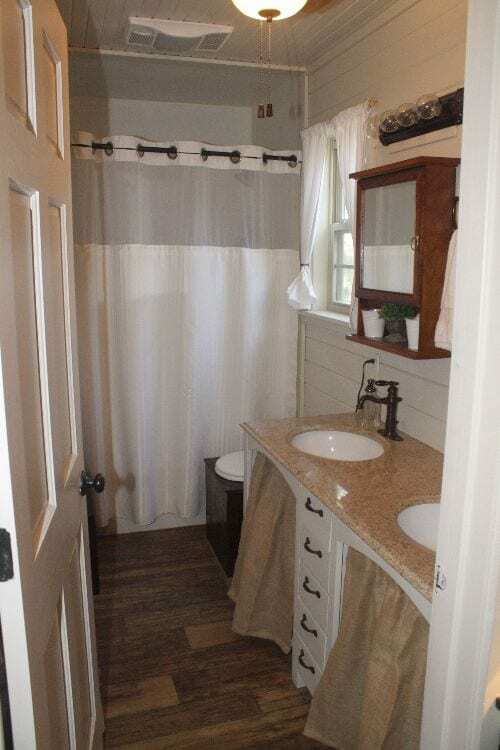 While the country farmhouse-looking home looks simple and quaint from the outside, it’s quite luxurious on the inside. I mean this place looks like a fancy hotel! And it’s all because of the mother-daughter touch. And while 406-square-feet doesn’t give you a lot of space, this home has everything one can need thanks to its smart design. It features a living room space, a canopy bed, an electric fireplace, a galley kitchen, double vanity bathroom, office, and laundry space. That’s a whole lot for 406-square-feet but the right furniture and built-in storage gets the job done. This home sports a full kitchen. It has everything! 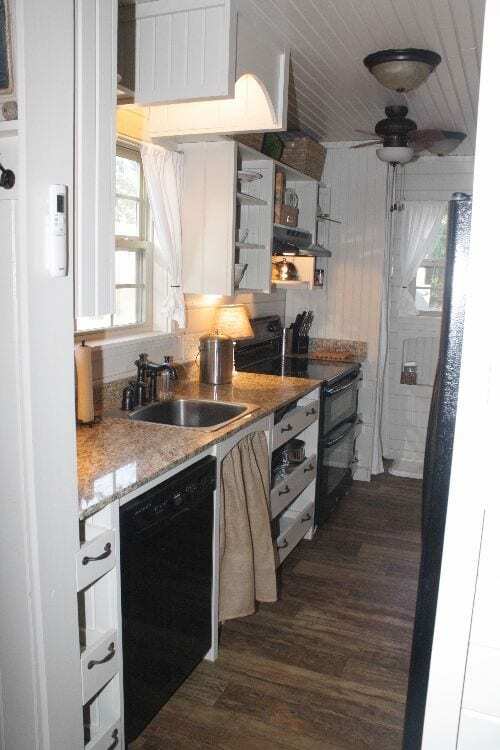 A full stove and oven, a decent sized granite countertop, a good-sized sink, and full-sized refrigerator. It even has a dishwasher! 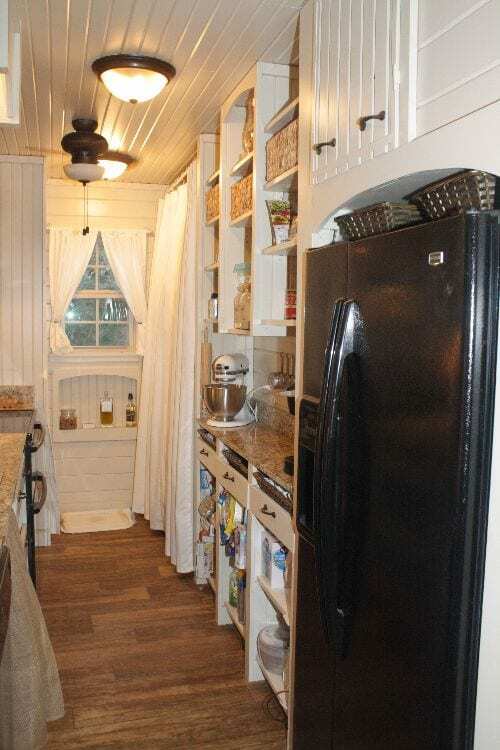 Both sides of the kitchen contain open cabinets and some drawers that roll out for maximum storage. The bathroom is also pretty huge. 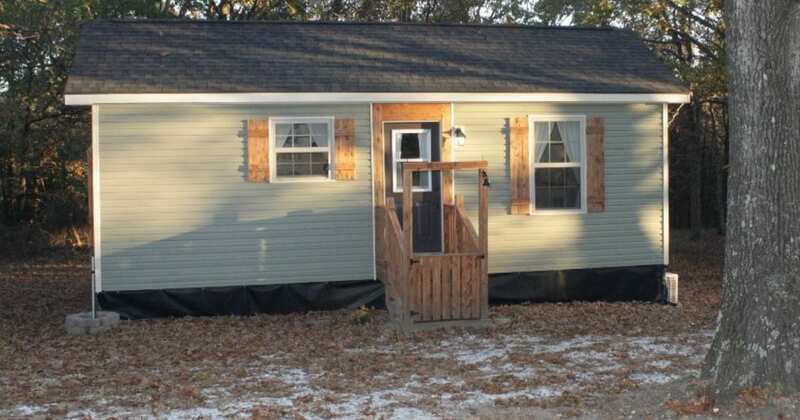 It has granite countertops, a double sink, and a toilet. The shower is full-sized. And this place gets even fancier! Look at this gorgeous bedroom! The canopy bed is simply divine. It contains a bed underneath it that can be pulled out when there are guests. 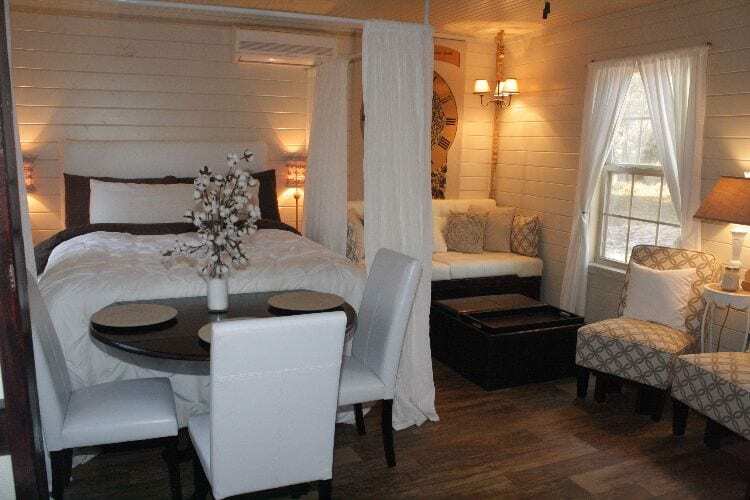 The beautiful white colors are repeated to the side of the bed where there is a small couch and a few chairs which serves as a living room space. In front of the bed, there are a dining table and some chairs that is just the right size for three to enjoy a meal. The entire home is connected by beautiful wood floors. The electric fireplace adds heat and coziness to the space. Above the fireplace are mirrored cabinets that help make the space look larger. You’ll also find hooks hung for additional storage. The home was also crafted with built-in shelving. This built-in shelving has lots of storage space. Using white storage containers keeps the space looking rich and light. It also includes a built-in desk that creates a tiny little office. There are windows throughout the home to let in natural light. You would never ever think that all of these amenities could be fit into such a tiny space when you look at it from the outside. But this mom and daughter duo truly outdid themselves with this country charm design.